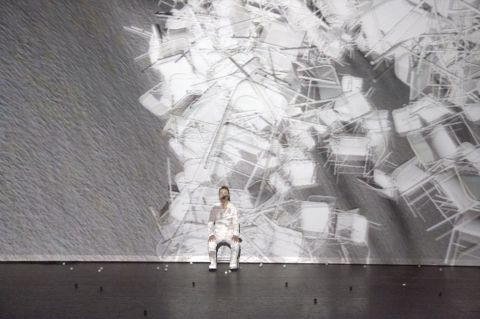 winterreise – songs and places is an acoustic-visual performance in which Schubert’s classic is understood as a dialectical landscape. A virtual landscape is the antithesis of a surrounding landscape; a political landscape is the thesis that counteracts a romantic one. Electronic ice is attacked by the warmth of the human voice: a cold avatar discovers his circumstances and finds himself in a world that is constructed like a city, like a wood. A mountain that could consist of data, a memory that feels like fate, a red sun, a black tie, a runny nose, a violet ocean, a broken chair, the silence of snow, the smell of perfume/sweat. The singer, the actor, the musician, all can disappear on the horizon, observing the landscape and merging into it. Using video-game technology and music a virtual landscape is travelled through on stage, always in search of political/restless, surreal/mental and electronic/mechanical spaces.